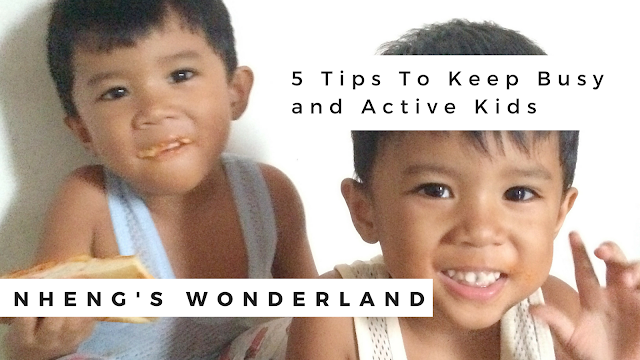 In the same way as other children, my kids are very much active especially my twin-boys. They are already on the stage where they would try anything out of their curiosity. They are super energetic and full of fun. In the event of ensuring they grow up fit, stay active, and busy, we need to keep up with them as we juggle our time with work, family and physical activities. So here's 5 tips to keep busy and active kids. Let them play outside. Minimize television activities by letting your kids play outside. This is my kids favorite activity. They learn how to deal with other kids and enhance their interpersonal skills. Fresh air and sunlight are also good for them. Let them be kids. Healthy and creative snacks. Kids are hungry most when they are active. But sometimes they won't eat something that they are not familiar with. We can't help but sometimes let our kids eat unhealthy snacks. So what we do is trick them by incorporating it to their favorite food. Adding colors to their meal is another tip to keep them active. Give them fruits which you can let them pick by themselves if you let them go with you at the market. Give them the right vitamins. By giving food supplement to our kids it will help them not busy and active kids but also it will make them healthy. Having a hard time giving vitamins to your kids? Choose a brand that has a yummy flavor and they will not notice it. As most kids love chocolates, give them ChocoVit Syrup. This is the first ever Chocolate flavored vitamins! A food supplement with Vitamins and Minerals with Zinc that is made from yummy chocolate! Giving vitamins is never been easy! Make chores more fun. My kids can follow simple instructions on small chores. They know how to put their toys in order after playing with them. And because we have twins, we let them race on who will go faster. Of course it will be a safe competition, everyone wins after. We give them prize, they love food for a prize. It's a win-win situation. Enjoy every moment with your kids. The best gift that you will give your kids is your time. Family time can be challenging but we still makes the best of it. As a way of catching up on the kids' super active lifestyle, we play with them every weekend or any day if our time permits it. Eating together is also a way of our bond together. So how do you make your kids active and busy? Share it on the comments below.